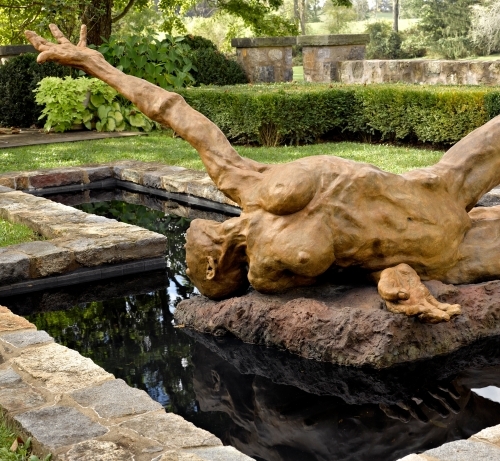 I sculpt the figure to express yearning—a complex emotion that stems from contradictions. Rooted in conflict and misery, yearning is the engine that propels us to overcome insurmountable obstacles and change reality. Yearning is primal and timeless. Yet every period has a need to define it as its own. Nowadays, yearning amplifies voices of lost touch and connectivity that were the bricks of human interaction in the past. Powerful accomplishments have brought fast changes in every facet of life. But they have also given birth to increased uncertainty, mobility, indifference and isolation. I have selected the human body as the most direct and intimate metaphor to reflect on the desire to connect and reach. The figure has been the most used subject in the history of art. But today’s creative freedom and changes in aesthetic criteria and social norms have provided me with the option to address the body with a personal vocabulary and turn it into a metaphor for a larger message. To express the dialogue between power and vulnerability, I have chosen the female figure as a representative of both sexes. The relatively new quest of women for equality with men prompted me to desert the old image of delicate femininity and replace it with powerful over-life-size muscular nakedness that still sends out a message of loss and longing to be elsewhere. To increase their exposure, the women are bald and their bronze-skin is raw. These stand as painful scars of contemporary lives. But stripping of any detail, which could have anchored the figures in time and place, broadens their timelessness. The editorial stripping expanded into replacing the entire figure with those body fragments that were essential to the message and led to the sculpting of hands. 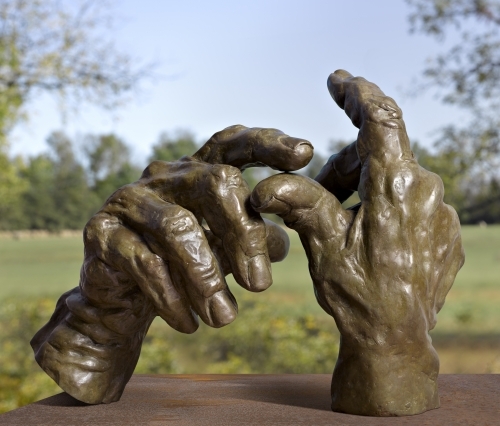 My fascination with hands, that have since become the subject of my monumental public artwork, started with their rich unique imagery. When the hand is flat with joined fingers, it is a rectangle; when the fingers spread out, it becomes a tree, and when they curl into a fist, the hand is a ball. The emotional landscape is even more exciting than the architecture. Separately, in their independence from each other, hands can present extremes of emotions. But together, they become a force of sameness and the ambassadors of touch. Not less important is the hands’ void of identity. It is a feature of strength that enables them, unlike portraits, to represent all mankind. As such, hands, in spite of their figurative nature, stand as universal symbols. They embody our awareness that we must touch the other in order to survive. Touch is what we most yearn for. It is a wonderful testament to human resolve that experiencing life, even with the greater anxiety of today, has not diminished the long lasting power of yearning. Although this emotion contains absence and want, it holds the promise that in the conflict between reality and desire – desire wins.